James Kunstler spoke last night as the opening lecture of the 2006 Illahee Series focusing on Oil + Water. Kunstler did not veer too far from his recent book The Long Emergency, and he also did not bother with a lot of graphs and slides on peak oil (or as he calls it, the ‘permanent global oil predicament’). Being a novelist as well, his lecture was more of a story about where America finds itself at this point in time. I’ll just try to touch on the main messages of his talk. 1. The idea that Technology is not equal to Energy. Technology depends on energy, and can leverage energy, but it is not energy itself, nor does it create energy. 2. He identified two ‘impediments to thinking’ about the energy situation. 4. A distinct lack of ability in the media and power structure to question assumptions and think critically. For example, Robert Reich’s talk about 20-30 more years of China’s development on the current path, or David Brooks on the continuing growth of outer Phoenix, Arizona. 5. A slide of the formerly middle class into ‘economic loser’ status, as the ability to drive becomes less democratic (ie. more folks won’t be able to afford it), and they are stuck in houses that are losing value while being far from any jobs, schools, etc. His vision is a gloomy one; that we’ll get what we deserve, not what we expect. I think he’s right on many points even if the timing is hard to pin down. In the meantime, local efforts at sustainability and community building seem to be the most worthwhile pursuits. Yesterday was a gorgeous day in Portland, and I got out to take a few photos. These are some shots from the new Tanner Springs Park in the Pearl District. The other end of the park has a little pond (presumably spring fed), bordered by a wall made of old rusted railroad tracks, and these are two views of the wall. Back in October I upgraded the blogging software that I use (WordPress), and at that time decided to give Google AdSense a try. This program places ads on the blog, and as people click on the ads I get a little slice. So I let it run for the last three months, and I had earned a total of 33 cents! At that rate I would get my first $10 check from Google sometime in 2010. I’ve decided that I’d rather just have a nice, uncluttered blog. Enjoy! By Curt | Posted in Uncategorized | Comments Off on AdNonSense! Yesterday I went to see Terence Malick’s new film “The New World” – the story of Pocahontas and John Smith and the first arrivals in Virginia in 1607. It’s a very dreamlike film, with beautiful images and music. What worked best for me was the portrayal of the utter strangeness of the first meeting of the native Americans and the English, the wonder and curiosity and fear and befuddlement all mixed together. And at times I felt like we were seeing the English ‘camp’ through the eyes of the natives, or ‘naturals’ as they are called in the film; a messy, dump of a place with early versions of now standard suburban single-family homes (in fact, it’s the first gated community! ), which looks completely ridiculous compared to a native camp. The moment of Pocahontas’s arrival in England is also a wonder – diving into a whole new, busy world. Beyond one fight with the natives there’s little action in the film, and surprisingly little ‘action’ between Pocahontas and Smith. So be ready for a meditative look at the beginnings of a cultural collision. Richard Heinberg, author of The Party’s Over and Powerdown (both on the challenge of peak oil), spoke in Portland, OR last night. Here are a few of my notes on the talk. The peaking of world oil production presents the U.S. and the world with an unprecedented risk management problem. As peaking is approached, liquid fuel prices and price volatility will increase dramatically, and, without timely mitigation, the economic, social, and political costs will be unprecedented. On the topic of ‘what can be done’ Heinberg proposed a few ideas. The major one was the concept of an international Depletion Protocol, which would involve producing countries signing on to cut back on production of oil, and importers to cut back on imports, both based on a global depletion percentage. He argues that this would help to stabilize the oil market, and thus be in both national and commercial interests. I’m a little skeptical given the huge incentive to fudge the numbers (as has happened with OPEC for years). Certainly we are already seeing a fair amount of turmoil in the oil markets, and it’s unlikely to settle down! He said that the ‘rational expectation’ for the future after the peak is realized would be repressive fascism in the US and global oil war, but that he personally couldn’t give in to that expectation. However when asked about the impact of consumerism, Heinberg first, perhaps a bit facetiously, mentioned ‘banning advertising’ (which sounds pretty repressive to me!). He also talked about the possible use of quota rationing with trading allowed, saying that he preferred that to simply letting price rise, which would have harsh social equity ramifications on the poor. I presume he envisions a system where perhaps each registered car owner would get coupons to buy a certain amount of gas at the market price, but could sell those coupons if they weren’t needed. Heinberg felt that the time had already passed for a fuel tax to be politically possible. And clearly the current administration has no interest in mitigation strategies. So the message is that it’s going to be up to local groups to take action. The DVDs for the first half of Battlestar Galactica‘s second season are out, and if anything the show is more intense and brutal than before. Here’s a good critical look at where the show’s been and where it’s going (from the very thoughtful blog ‘Asking the Wrong Questions’). On the occasion of my first tournament victory last night, I want to put a plug in for the Northwest Poker League, which holds free No-limit Texas Hold’em games in the Portland/Vancouver area. Local bar/restaurants host the events, which are held just about every night, and the league supplies dealers and chips. It’s a well-run outfit that helps get people out to local establishments, and the game itself, while easy to learn, is pretty darn complicated when it comes down to it. 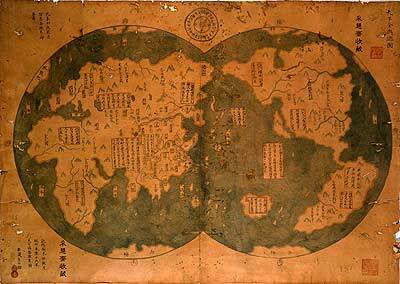 A Chinese World by 1418? Interesting story in The Economist that indicates that China may well have ‘discovered’ most of the New World back in the early 1400s. Note that Australia is shown (not in the right position, however), and California is shown as an island (seems understandable if one found the Baja and did not carefully circumnavigate). By Curt | Posted in News | Comments Off on A Chinese World by 1418? Q: How will the US deal with China as a superpower? NC: What’s the problem with China? Q: Well, competing for resources, for example. NC: Well, if you believe in markets, the way we’re supposed to, compete for resources through the market. So what’s the problem? The problem is that the United States doesn’t like the way it’s coming out. Well, too bad. Who has ever liked the way it’s coming out when you’re not winning? China isn’t any kind of threat. We can make it a threat. If you increase the military threats against China, then they will respond. And they’re already doing it. They’ll respond by building up their military forces, their offensive military capacity, and that’s a threat. So, yeah, we can force them to become a threat. We’re not allowed to concede that our leaders have rational imperial interests. We have to assume that they’re good-hearted and bumbling. But they’re not. They’re perfectly sensible. They can understand what anybody else can understand. So the first step in talk about withdrawal is: consider the actual situation, not some dream situation, where Bush is pursuing a vision of democracy or something. (now I might quibble with the wording a little – we citizens are of course allowed to think what we want, but perhaps the media is a bit more ‘constricted’ in its approach). Killing Time is Feyerabend’s short autobiography, written shortly before his death in 1994. He is indeed a rather flippant personality, who had a strange academic career, after time as a soldier in WWII which left him unable to walk without crutches. There’s a funny story about a job interview visit to a university in Switzerland, where they ask him why he wants the teaching job. He tells them it’s because the pay is good and the workload is light. I can sympathize with his point of view.